Table styles have been introduced in LibreOffice Writer 5.3 as the successor to the AutoFormat feature. The table designs from this old feature were used as the initial set of table styles, so we asked on the design mailing list to submit proposals for new table designs and finally ran a survey to include the entire community in the process. The survey comprised of all designs with a standardized table of data presented in a randomized order. Participants were asked to report their preference/liking or disliking to each design on a Likert scale. 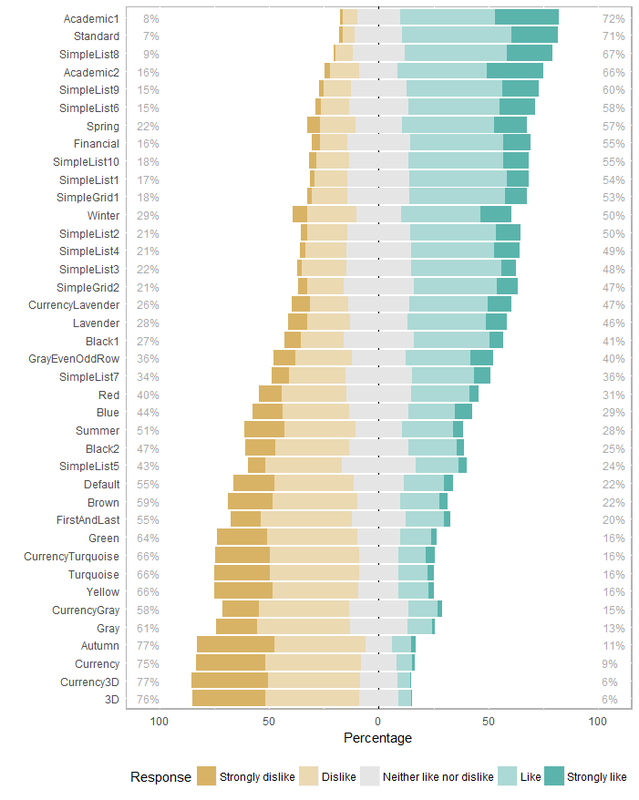 The analysis was done with a stacked bar plot, where positive replies of like or strong like are displayed right of the center and negative replies are displayed to the left of the center. Figure 1: User responses (see this image for an overview of the designs; raw data and R scripts are available here). In total, we received 534 responses. The results in figure 1 clearly demonstrate the preference for clean and simple table designs, ideally with only horizontal lines. It also shows that the legacy designs, marked with an asterisk, are outdated. In the survey, it was also possible for participants to comment on the designs. Many comments criticised the outdated designs, bad contrast, and inappropriate alignment. Suggestions regarding colors ranged from avoiding colors at all, over using pastel tones, to vivid and “tropical” colors. It was recommended to provide a flat design with no lines but good spacing between cells and alternating row colors. Another topic was the justification where headers are often requested to be aligned with the content, i.e. right aligned for numbers, but also centered titles was prefered. We take this result as a clear agreement to remove most of the legacy styles, which was was one of the main questions of the survey. As we intentionally do not design by committee, but involve the community as a true Open Source development, we need your agreement from time to time to remove parts that are not zeitgeisty anymore. Diversity of opinions and independence of a particular person is crucial to us. Figure 2: New proposal for colored tables. As discussed in the blog post Style your Table, the function is limited to the properties first/last column/row, alternative row/column, and the base style with paragraph style for each of these elements. Of course we are still open to include your proposals for new table styles, so feel free to submit your suggestions here, attach it to the ticket tdf#101349 on Bugzilla, or add a link to it in the comments. To cut a long story short: “Less is more”. If things get removed ( I like the updates by the way) maybe a good measure against problems for users who relay the removed options (in this case obsolete table styles), maybe an extension can be offered to people who prefer the old way of things? Or is creating extensions out thins like this too much work/too hard? Table Styles are today hard coded in a binary file. We have an enhancement request to store Table Styles in Xml format, and it makes much sense to allow additions via extensions. That requires coding to search in the user space, though. Sorry, IMHO the tables proposed may be good for prices of roller-coaster rides in amusement park, but definitely not for publications, reports or any formal documents. First, we should think about every new style’s appearance in print. How the color one will print in mono? How mono would look when passed through color printer? This requires some tests. Contrary to popular beliefs in Open Source world, not everyone has the top-quality mass-printing grade printer. This is important as we don’t have any target-aware style switching mechanism and nothing seems that any portable program will have such one. There should be some file with table styles, I don’t know, document with structure, INI file, XML, which has these formats, and user should have control over this file. Recently taken step with removing such files support with color palettes made some users, especially doing publishing the same thing with multiple requirements, have a sticky notes with palette in “R/G/B” format on displays as they couldn’t use own palette files without messing up with filesystem. This is not how it should work. Yes we are looking into printer friendly tables first cause you don’t make a webpage with writer. So we had a look to LaTeX and there rules for good looking tables. As LibreOffice will offer easy configuration for header, table row, … it’s complex for the designer but easy for the user to configure the table style to there needs. 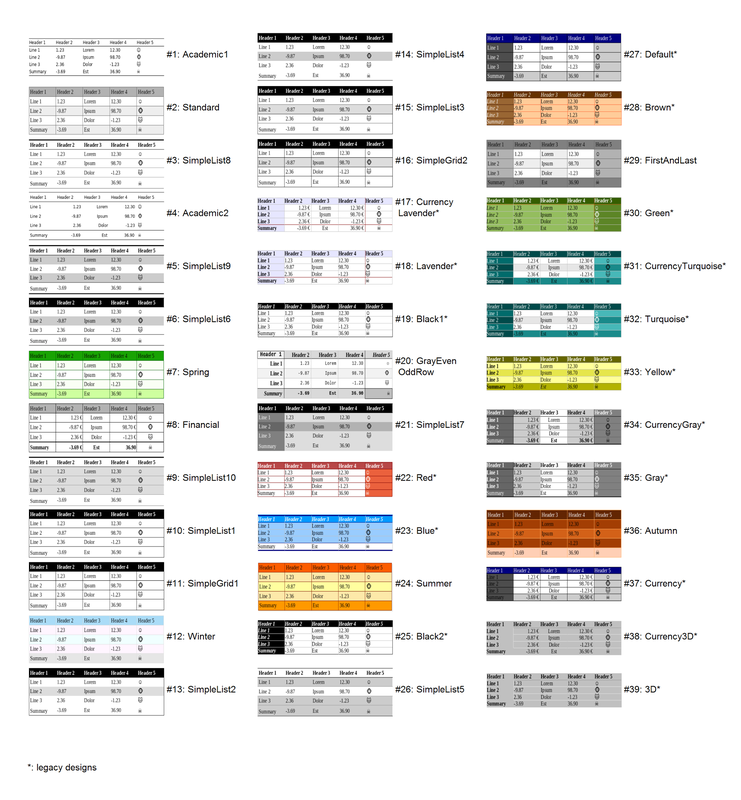 After have working print tables color was added cause the rules from LaTeX and Webdesigners aren’t that different. And the last step is to reduce complexity that the user can adapt the default style easy to there specific needs. Figure 2 looks lightyears better than the survey samples. I think the biggest changes are in sane use of color and shade, spacing, and most importantly, sans-serif fonts. What turned me off most about the samples as I was going through the questionnaire was the typography. I might have rated some styles higher if font and spacing were better. I tried to ‘imagine’ an improved version of the samples along these lines but most of what apparently were legacy styles I could not be so creative with. LibreOffice Design Team Copyright © 2019.